Various building materials are used today to align and beautifully decorate the ceiling. One of the most popular is drywall, it allows you to level the surface without using wet processes. 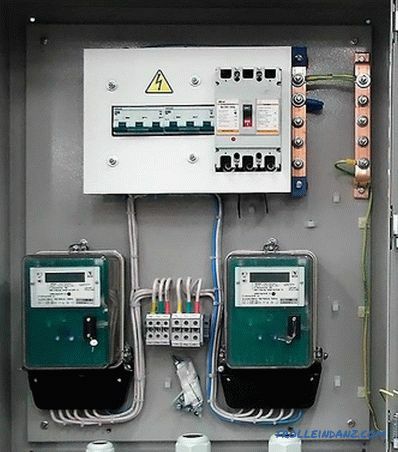 This ensures high quality, speed, minimal cost. Making the ceilings is quite possible to do it yourself, which is not the case for tension materials, for the installation of which requires special thermal equipment and experience. 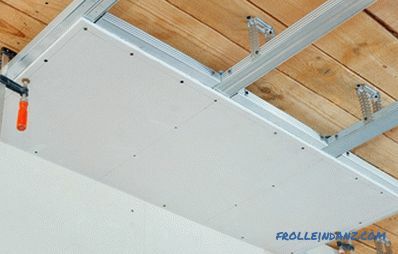 The fasteners of the plasterboard onto the wooden ceiling allow leveling the surface without using wet processes. Plasterboard is fixed to the wooden ceiling by various methods, and gluing or fastening directly to the ceiling of the wood can be used. It is possible to use lathing from bars or a special metal profile. Each of these methods has its own advantages and disadvantages. Working conditions are slightly different, as are the requirements. If the surface of the base base curve, it is best to do the installation of crates. When the wooden ceiling is smooth, the drywall is fixed with glue or screws. 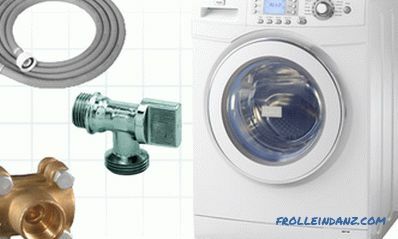 There are several options for the GKL fastener. It is considered the simplest to use sticking or screwing directly onto the base of the wooden ceiling. This method is rarely used, since the base must be in perfect condition. Two other ways are that the sheets are attached to the frame, it is made of wood or galvanized metal. Before laying drywall on the ceiling, an assessment is made of the overall condition of the surface . It is checked whether there are traces of rot, falling boards. If defects are found, you must first repair the base, after which you can begin to fix the plasterboard. It is recommended to mount the wooden boards with antiseptic and fire retardant before installation in order to maximally protect the structure from rotting and flame. The cost of the work is extremely low, it is enough to buy only plasterboard sheets, glue or screws. There is no need to preliminarily perform work on the device of the batten, and this significantly reduces the time and cost. The height of the room is fully preserved, since only the thickness of the sheet is concealed. When a frame is used, the height is reduced. For small rooms with low ceilings, this is critical. The tool requires a minimum, only a spatula is needed for applying glue or a screwdriver, a knife for cutting GKL. 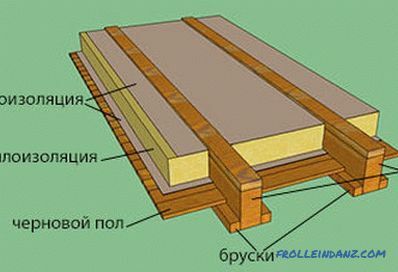 The base must be perfectly level, and this is not always possible, especially for wooden ceilings. The reliability of this method strongly depends on the quality of the base surface. 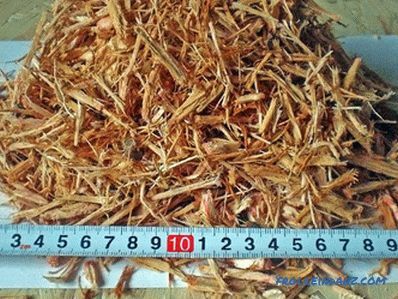 For example, it can be used for larch, which refers to solid wood. If the wood has a soft structure, then apply fasteners to the base is not recommended. During operation, deformation of the gypsum plasterboard may occur, and this is affected by temperature changes. Boards under the influence of external conditions can swell or shrink. Heater can not be applied, because there is no frame, between the slats of which he could fit. You can fix the drywall on the wooden ceiling on the batten. This is a lightweight design that allows you to straighten the base, to make the surface smooth and attractive. Reiki installed quickly and easily, but you must first apply the markup. 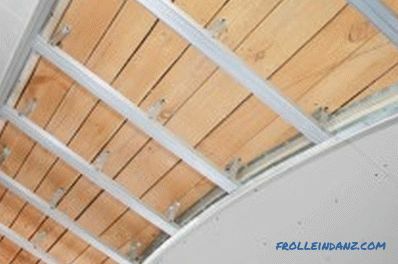 Plasterboard fasteners on the wooden ceiling can be made on the sheathing, giving the surface leveling and an attractive look. Structural strength. This option makes it possible to install a chandelier, a cornice, etc. on the ceiling, if the weight is not too significant. If in places of fixture of a chandelier to install a rail of sufficient thickness, then it will act as a mortgage. Environmentally friendly design. The tree is absolutely safe, it does not emit any harmful and toxic substances. It is possible to insulate the ceiling. If you lay insulation plates between the battens of the batten, the ceiling will minimize the heat loss, make the room not only warmer and more comfortable, but also protect the finishing materials. The fastener of wooden slats is limited. It can only be used for dry rooms. For the kitchen or bathroom, this option is no longer applicable. 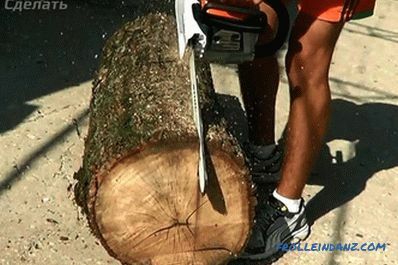 Reiki can be deformed during operation, so you only need to take a fully dried tree. Installation is long, as all the slats must be properly prepared, treated with an antiseptic and fire retardant, drill holes for fasteners. Before starting work, it is necessary to attract an assistant; it is difficult to mount the slats to the ceiling yourself. The framework for the ceiling of plasterboard. fasteners for the profile in the form of "butterflies". The process of fixing is simple, the gypsum board is screwed to the frame. 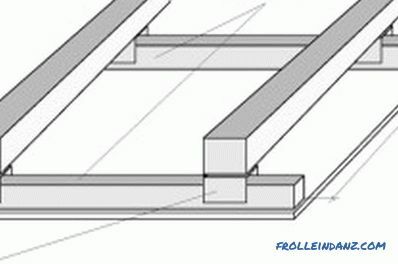 Profiles are pre-attached to the surface of the ceiling and walls. If there is a need to hang up chandeliers and curtain rods for curtains, then you should immediately fasten the mortgages — boards with the required thickness — even before covering the ceiling. The design is as strong as possible, the metal profile is reliable. Installation of drywall is more durable, loads can be sustained large. The thickness of this profile is only 0.35-0.7 mm, but this is quite enough for excellent fasteners. A heater can be installed between the profiles, as a result, the ceiling will be warmer, the heat loss will be minimal. 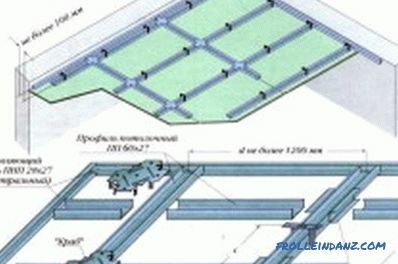 The metal profile is made of galvanized, maximum protected from moisture. The installation of drywall is simple and fast, the marking is performed the longest, as it is necessary to observe maximum accuracy. It is possible to immediately buy all the necessary components, but for wooden slats this is impossible, they are cut on their own. 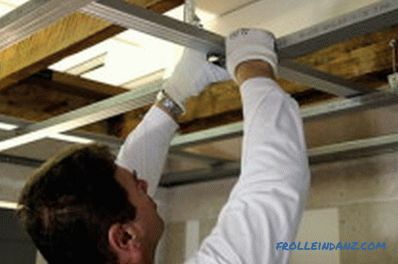 Due to the richest assortment of metal profiles, you can create multi-level ceilings with your own hands. Installing drywall on a wooden ceiling levels the surface, and you can also decorate it in any way you like. Many people mistakenly believe that drywall is difficult to process and surfaces can only be made smooth, but this is not so. Installation of curved surfaces, framing semicircular arches and much more. This technology is simple, the installation itself involves the use of a profile cut and a plasterboard sheet. 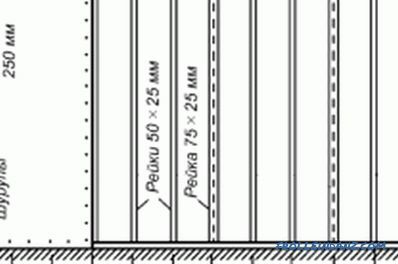 The cost of a metal profile is higher than wooden slats, but you need to buy special brackets, guides, transverse elements. During operation, you will have to use metal shears, otherwise the profiles will not be able to be cut into the necessary parts. Installing drywall onto a wooden ceiling allows you to quickly and easily make a beautiful and level surface. Then it can be decorated in any desired way. This may be painting with special textured paints, the use of wallpaper and stretch fabrics. The surface is smooth, other work is not necessary, you only need to seam the seams and attachment points of the screws.